Image Source: Dead Space 2 via Ars Technica. 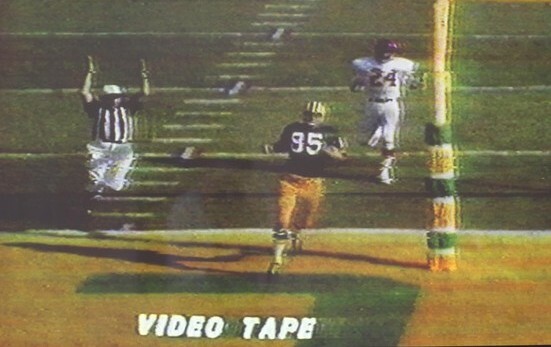 Inset of Hubbard by Ars Technica. 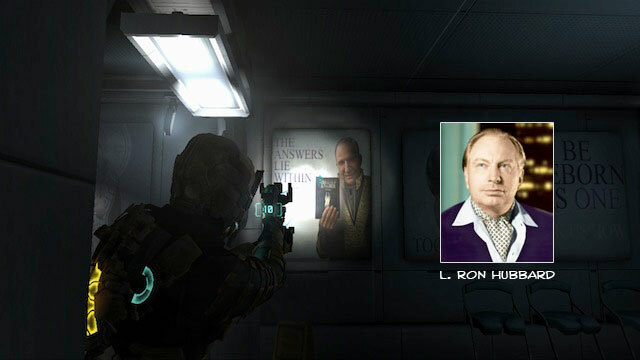 Ars Technica is reporting that the survival horror video game Dead Space 2 (released 25 January 2011) is filled with actions that encourage the player to attack Scientology-based imagery and messages, including a figure named L. Ron Altman, who strongly resembles Scientology founder and sci fi writer L. Ron Hubbard. Pictures courtesy of Eirik Evjen via the BBC. A photographer has managed to capture the Northern Lights phenomenon in Northern Norway, after he decided to place his camera on top of a mountain to shoot a time lapse of the sky. Eirik Evjen who lives in Lofoten, took the pictures on Friday and was amazed by the results. "It was very cold outside so I had to wrap the camera in the warm clothes I was wearing," he said. "I got a real surprise when I picked up the camera eight hours later." This phenomenon reflects violent eruptions on the sun. Some suspect an eclipse and solar weather (December 29-31 - summarized here, and in early January here, here: "As expected, a solar wind stream hit Earth's magnetic field during the early hours of Jan. 7th. The impact sparked a G1-class (Kp=5) geomagnetic storm and bright auroras around the Arctic Circle") may have affected Earth's magnetic fields and possibly contributed to the mass deaths of fish and birds, which I blogged about here and which is apparently continuing, even though media interest has died down. Several media reports state that mass bird and fish kills are normal. The conspiracy theorists of course think otherwise (as here). All of these theories should be taken with a grain of salt. 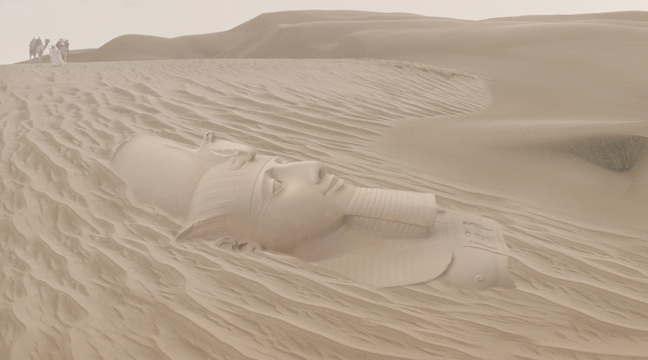 Time and Politics 4: Will Egypt Follow the Ideology of the Long View? Reflections on Shelley's famous poem, Ozymandias, which refers to Ramses the Great. Image Source: Hamilton Wiki. In all the debates about what will happen in Egypt with the current régime, one possibility that is pointedly not being discussed, at least in the press, is the potential reinstallation of the last reigning member of the House of Muhammad Ali, Fouad II, and the transformation of Egypt into a constitutional monarchy. 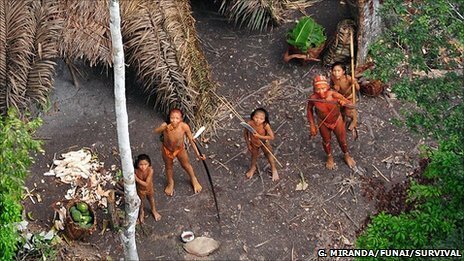 Meirelles calls these people "the last free people on the planet." This iPhone app won papal endorsement. Image Source: New York Daily News. There are two new reports out about iPhone apps that show the curious interfaces between technology and religion on the one hand, and technology and war on the other. The first report (here and here) gives details on a Vatican-supported application that lets you confess your sins and say the required prayers and pay penance. 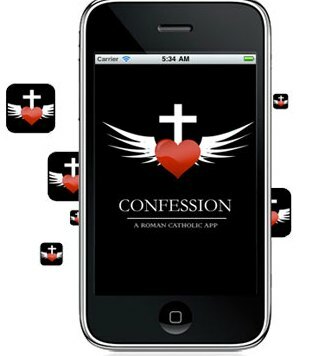 The app, called Confession, sells for USD $1.99, and also allows you to save all your sins so you can keep track of them. This way busy people do not need to visit the Churches except to seek Absolution from a priest. Taliban Tracker for your iPhone. Image Source: Fox News. Caption for the above photo: U.S. Army Sgt. 1st Class Paul Shoemaker, 3rd Battalion, 321st Field Artillery Regiment. U.S. Army Capt. Jonathan J. Springer tests his new smartphone app in eastern Afghanistan's Pech River Valley Jan. 17. The navigation application displays a Military Grid Reference System, plots waypoints, and gives directions in Mils. The idea for a smartphone application to assist soldiers in combat came to Capt. Jonathan J. Springer in a dream last July, he said Monday. The 31-year-old, from Fort Wayne, Ind., has worked with programmers ever since to make the idea a reality. 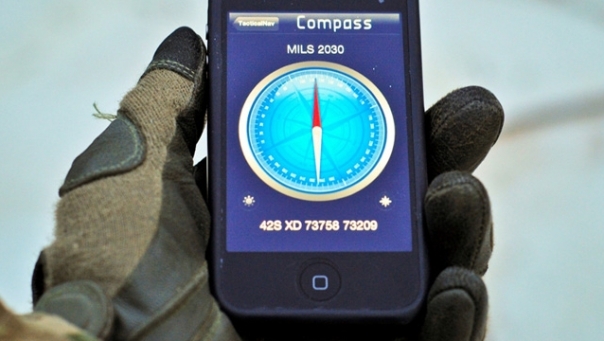 Tactical Nav, which is expected to be available through Apple’s App Store next month, assists soldiers in mapping, plotting and photographing waypoints on a battleground and conveying coordinates to supporting units. Springer used a variety of armored vehicles, remote observation posts and harsh combat conditions to test the accuracy of his invention, which can also be used to direct artillery fire on enemy positions or call in helicopter support. Springer, who serves as a battalion fire support officer in eastern Afghanistan, said most soldiers use smartphones and the app has been designed specifically for them. “Since day one, I always believed that smartphones could be utilized by the U.S. military for combat purposes,” he said. 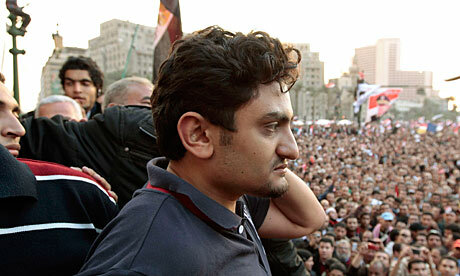 Wael Ghonim in Tahrir Square, Cairo today. Image Source: Dylan Martinez/Reuters via the Guardian. Various mainstream news outlets are reporting (for example, The Republic, Reuters, the New Yorker, the New York Times, The Guardian and the BBC) that Egyptian authorities questioned an Egyptian Google employee; he was detained and blindfolded for 12 days. Wael Ghonim (his Twitter site is here), Head of Google marketing for the Middle East and North Africa, was then released yesterday and gave a tearful interview on television, broadcast last night, in which he called the protesters "heroes," while he was just "the Admin." Since then, his comments have breathed new life into the protests, and hundreds of thousands of people have converged today on Cairo's Tahrir Square, with some hundreds heading over to the parliament buildings, where they are repeatedly shouting, "Fraud." One of the most important aspects of these protests is that they were sparked by and driven by the internet. WiliLeaks played a role in Tunisia, which in turn inspired protests in Egypt. A Facebook page was dedicated to Ghonim when he disappeared (here). This is a revolution which is driven by the internet, and by the younger X and Y generations that are most tech-savvy, not a single human leader. You can see a subtitled version of yesterday's explosive Dream TV 2 interview with Wael Ghonim here. According to this site, there are several people working on English subtitles right now for the whole interview. His first words to the media after being freed are posted in a video below (with subtitles). 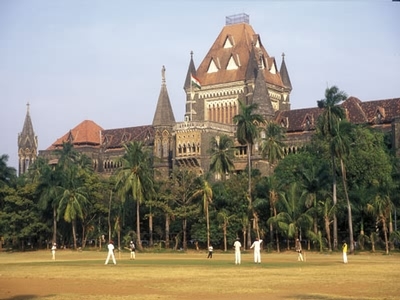 The judges at Bombay High Court have spoken. Image Source: Mumbai Blog. 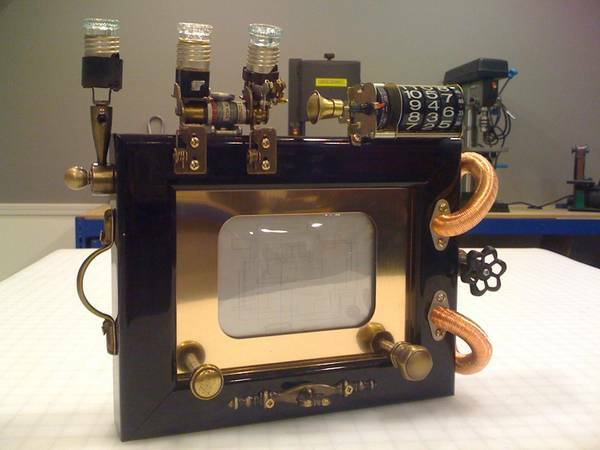 Boingboing is carrying a picture of a Steampunk-styled Etch-a-Sketch (Hat tip: @swadeshine). The designer comments: "I supposed I could have called it Vintage Futurist Self Contained Clockwork and Valve Powered Mechanical Anachronism." More from her below the jump. Image Source: Wall Street Journal. 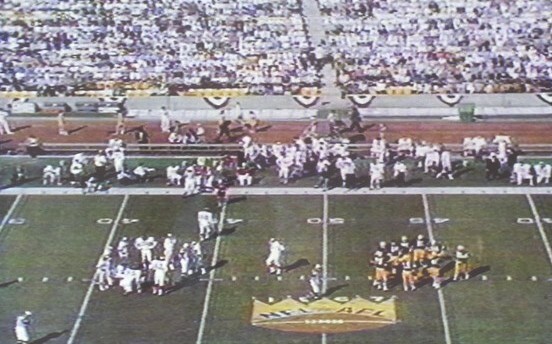 The Wall Street Journal is reporting that the 'holy grail' of American sports footage, of the first ever Superbowl game on 15 January 1967, has been located. (Hat tip: Slate.) More on the video below the jump.